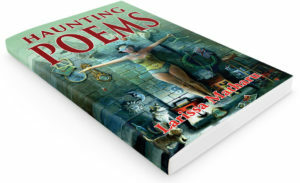 Haunting Poems explores the journey of life, sanctity and spirituality, good and evil, forgiveness, education, misogyny in the Indian culture, child abuse and mental health. The book cover painting is Enigma by Phil Lockwood. The back cover painting is Larissa and Theology by the late Professor John Bastin MA PhD FRAS. This entry was posted in Marriage by product reviews. Bookmark the permalink.